It’s another Readercon episode! First, Liz Hand rejoins the show for a little conversation about what she’s been reading lately (it’s some creepy stuff, of course), the regenerative aspects of Readercon, why the novella is ideal for dark/spooky fiction, and whether the attendee wearing an ASIA t-shirt is doing so ironically. Then John Clute talks about the ruins of futurity and the launch of the Clute Science Fiction Library at Telluride Institute. We get into the need for visual presentation and accessibility of original books in their context (including dust jackets), his transition from book accumulator to collector, the externalization of one’s mind into one’s library, why he doesn’t write fiction, the Easter eggs he sneaks into the Science Fiction Encyclopedia, why Galaxy Quest is the best Star Trek movie (except for Wrath of Khan), reaching a uniform degree of incompletion, generational shifts in SF/F, and the sneaky adoption of Fantastika. Give it a listen! And go buy Liz Hand’s new collection, Fire. , and her Cass Neary novels: Generation Loss , Available Dark , and Hard Light ! Elizabeth Hand flunked out of college a couple of years after seeing Patti Smith perform and became involved in the nascent punk scenes in DC and New York. From 1979 to 1986 she worked at the Smithsonian’s National Air and Space Museum. She was eventually readmitted to university to study cultural anthropology and received her BA. She is the author of many novels, including The Winterlong Trilogy , Waking the Moon , Glimmering , Mortal Love , Illyria , and Radiant Days , and the Cass Neary novels, Generation Loss , Available Dark , and Hard Light , as well as three collections of stories, including Saffron and Brimstone . Her fiction has received the Nebula, World Fantasy, Mythopoeic, Tiptree, and International Horror Guild Awards, and her novels have been chosen as notable books by both The New York Times and The Washington Post. She has also been awarded a Maine Arts Commission Fellowship. A regular contributor to The Washington Post Book World and the Magazine of Fantasy and Science Fiction, she lives with her family on the coast of Maine. John Clute is a multiple Hugo Award and World Fantasy Award winner and Visiting Fellow at Anglia Ruskin University in Cambridge, England. He is perhaps best known for his editorship, with David Langford, and others, of the Encyclopedia of Science Fiction (sf-encyclopedia.com). As an illustrious and prolific reviewer and essayist, he has profoundly influenced science fiction writing in his time. Credits: This episode’s music is Nothing’s Gonna Bring Me Down by David Baerwald, used with permission from the artist. The conversation was recorded at the Marriott in Quincy, MA during Readercon on a pair of Blue enCORE 200 Microphones feeding into a Zoom H5 digital recorder. I recorded the intro and outro on a Heil PR-40 Dynamic Studio Recording Microphone feeding into a Cloudlifter CL-1 and a Mackie Onyx Blackjack 2×2 USB Recording Interface . All processing and editing done in Adobe Audition CC . Photo of Liz Hand and John Clute in the Soundcloud by Scott Edelman; not sure who the other/younger one is by. Either way, they’re not on my instagram. It’s time for our year-end Virtual Memories Show tradition: The Guest List! I reached out to 2016’s pod-guests and asked them about the favorite book(s) they read in the past year, as well as the books or authors they’re hoping to read in 2017! More than 30 responded with a dizzying array of books. (I participated, too!) Just in time for you to make some Hanukkah and/or Christmas purchases, The Virtual Memories Show offers up a huge list of books that you’re going to want to read! Give it a listen, and get ready to update your wish lists! This year’s Guest List episode features selections from more than 30 of our recent guests (and one bonus guest)! So go give it a listen, and then visit our special Guest List page where you can find links to the books and the guests who responded. Also, check out the 2014 and 2015 editions of The Guest List for more great book ideas! The guests who participated in this year’s Guest List are Glen Baxter, Ross Benjamin, Harold Bloom, MK Brown, Nina Bunjevac, Hayley Campbell, David M. Carr, Myke Cole, Liza Donnelly, Bob Eckstein, Glynnis Fawkes, Rachel Hadas, Liz Hand, Glenn Head, Virginia Heffernan, Harry Katz, Ed Koren, David Leopold, Arthur Lubow, Michael Maslin, David Mikics, Ben Model, Christopher Nelson, Jim Ottaviani, Ann Patty, Burton Pike, Frank Sorce, Willard Spiegelman, Leslie Stein, Tom Tomorrow (a.k.a. Dan Perkins), Andrea Tsurumi, Carol Tyler, Jim Woodring, and me, Gil Roth! Check out their episodes at our archives! Credits: This episode’s music is Nothing’s Gonna Bring Me Down by David Baerwald, used with permission of the artist. Most of the episode was recorded on a Heil PR-40 Dynamic Studio Recording Microphone feeding into a Cloudlifter CL-1 and a Mackie Onyx Blackjack 2×2 USB Recording Interface . Myke Cole’s segment was recorded at a friend’s apartment in NYC on a pair of Blue enCORE 200 Microphones feeding into a Zoom H5 digital recorder. All processing and editing done in Adobe Audition CC . 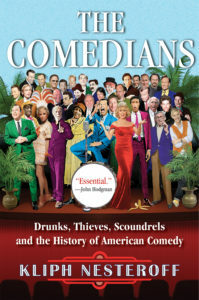 Kliph Nesteroff joins the show to talk about his new book, The Comedians: Drunks, Thieves, Scoundrels, and the History of American Comedy (Grove Press). We discuss the evolution of comedy over the century (from vaudeville to comedy podcasters) and how he got started chronicling it, American comedy’s twin themes of struggle and influence, the connect-the-dots game of comedic lineage, the stories that didn’t make it into the book, comedy’s role in the civil rights struggle, Kliph’s autodidactic background and how it shapes his pursuit of history, the story of how he got kicked out of high school, and more! Give it a listen! And go buy Kliph’s book, The Comedians ! 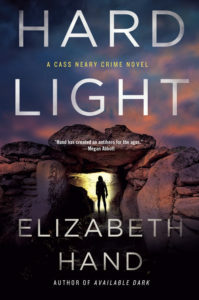 Plus, I give Liz Hand a call on the occasion of the publication of her new book, Hard Light: A Cass Neary Crime Novel ! We explore how her nihilistic, burned-out, drug-addicted post-punk-scene photographer-protagonist has grown over the course of three books of increasing mayhem and murder. (Hint: she doesn’t decide to become a nurturing mom and validate herself with a rich husband.) Go listen! And buy Hard Light ! Kliph Nesteroff is a former stand-up comic turned writer. A longtime contributor to WFMU, writing about the history of comedy, Nesteroff’s latest project is hosting the Classic Showbiz Talk Show, a live series in Los Angeles that has welcomed comedy luminaries like Mel Brooks, Fred Willard and Laugh-In creator George Schlatter. Credits: This episode’s music is Nothing’s Gonna Bring Me Down by David Baerwald, used with permission of the artist. The conversation was recorded at an undisclosed location in Manhattan on a pair of Blue enCORE 200 microphones feeding into a Zoom H5 digital recorder. I recorded the intro and outro on the same setup. The conversation with Liz Hand was recorded using Call Recorder on Face Time Audio; I was using a Blue Yeti USB mic . Processing was done in Audacity and Logic Pro. Photo of Kliph by me. 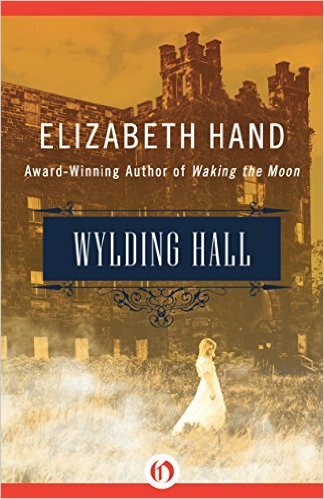 Award-winning author Elizabeth Hand joins the Virtual Memories Show to talk about her latest novel, Wylding Hall ! We also talk about her need to try different genres, that pigeonholing process, how abandoning the supernatural for her Cass Neary novels was like working without a net, how her success at writing may be attributable to the Helsinki Bus Syndrome, what it was like to be at the punk scene in the mid-’70s, how she learned to strip down her prose for her recent (and excellent) noir crime novels, just how she ended up in coastal Maine, and more! Give it a listen! Elizabeth Hand is the bestselling author of 13 genre-spanning novels and four collections of short fiction. Her work has received the World Fantasy Award (four times), Nebula Award (twice), Shirley Jackson Award (twice), International Horror Guild Award (three times), the Mythopoeic Award, and the James Tiptree, Jr. Award, among others, and several of her books have been New York Times and Washington Post Notable Books. Her recent, critically acclaimed novels featuring Cass Neary, “one of literature’s great noir anti-heroes” (Katherine Dunn) — Generation Loss , Available Dark , and the forthcoming Hard Light — have been compared to those of Patricia Highsmith. With Paul Witcover, Hand created DC Comic’s early 1990s cult series ANIMA, whose riot grrl superheroine dealt with homeless teenagers, drug abuse, the AIDS epidemic and racial violence, and featured DC Comics’ first openly gay teenager (the series also once guest-starred Conan O’Brien). Her 1999 play “The Have-Nots” was a finalist in London’s Fringe Theater Festival and went on to play at the Battersea Arts Center. She has written numerous novelizations of films, including Terry Gilliam’s Twelve Monkeys, and a popular series of Star Wars books for middle grade children. 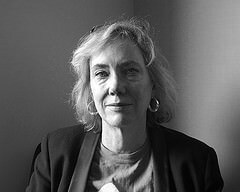 She is a longtime critic and book reviewer whose work appears regularly in the Los Angeles Times, Washington Post, Salon, the Boston Review, among many others, and writes a regular column for the Magazine of Fantasy and Science Fiction. Her books and short fiction have been translated into numerous languages and have been optioned for film and television. She teaches at the Stonecoast MFA Program in Creative Writing, and recently joined the faculty of the Maine College of Art. She divides her time between the coast of Maine and North London, and is working on the fourth Cass Neary novel, The Book of Lamps and Banners. Credits: This episode’s music is Three Hours by Nick Drake. The conversation was recorded at the Boston Marriott Burlington on a pair of Blue enCORE 200 microphones feeding into a Zoom H5 digital recorder. I recorded the intro and outro on a Blue Yeti USB Microphone . Processing was done in Audacity and Logic Pro. Photo of Ms. Hand by me.